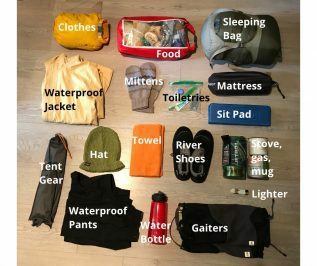 Safetravel has detailed packing lists for hiking in Iceland as seen here. This guide will provide more insight into those packing lists as well as explain how and where to pack these items. The first step to packing for a multi day hike is choosing a backpack that comfortably fits all your gear as well as any group gear you plan to share such as tents or climbing ropes. 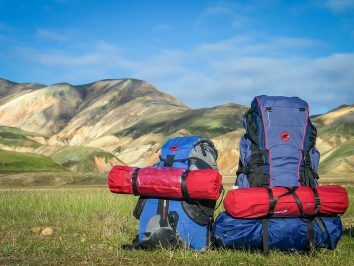 As a guide you’ll likely need 55 – 70L if doing a multi day hike such as the Laugavegur trail. Choose a bag with convenient pockets so you can quickly access snacks and rain gear. We also recommend having a rain cover for your pack. 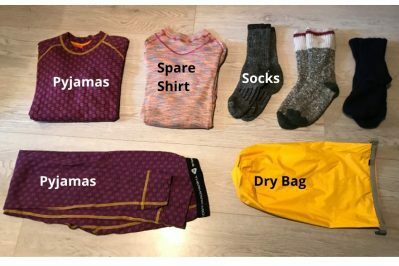 This will depend a lot on your preference but at minimum you will need one hiking outfit and one set of dry clothes to sleep in. 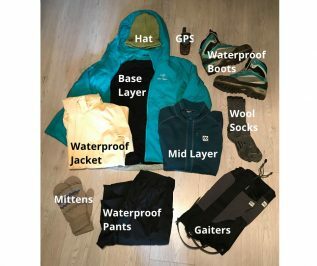 For hiking clothes we recommend using the layering system. The layering system allows you to manage your temperature by taking off layers as needed such as when you’re hiking uphill and get warm or when the weather changes suddenly. Keep your feet in good shape as you hike. Invest in quality hiking boots AND hiking socks. At times some of these layers will be in our pack but these essentials are usually close to the top for easy access. We left undergarments out of the picture but don’t forget underwear/boxers or sports bras as needed. Keep in mind that anything you pack adds weight you have to carry. No one expects you to smell good or look fashionable while hiking so only take what you need. The 3 heaviest things in your pack (besides food) will be your sleeping bag, mattress and tent. These are the 3 pieces of gear you should invest in. For your sleeping bag you can choose between down or synthetic. Down is lighter and warmer but synthetic insulates better when wet. Choose your sleeping bag based on your sleeping comfort temperature, whether or not you’ll be in huts or tents and the weather forecast. Usually comfort -5 to -10 celsius is a good guide temperature for summer camping in Iceland but some will find they need a warmer or colder bag to be comfortable. For your summer camping mattress you will want an R-value (the higher the number the better the insulation) of at least 3 to make sure you are not losing body heat to the ground. Air mattresses are more comfortable but more expensive than closed cell foam mattresses which are light and cheap – a good option if you sleep easily. For camping in Iceland in the summer you will want a 3 season tent. You will need a strong tent that can withstand wind gusts. We recommend bringing extra pegs to secure your tent properly. Tent with your friend so you can share the weight load between your packs. Many trails in Iceland are very well marked but often markers are knocked down by a storm or a sheep, or are under snow. For this reason its good to have navigation tools such as a hiking map (scale of 1:100 000 or less) and compass. 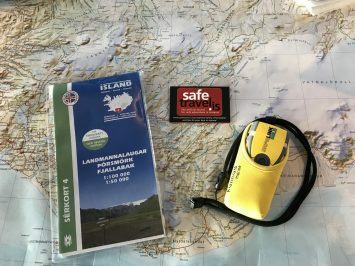 A GPS is needed if you are travelling in remote areas for multiple days (such as in Hornstrandir Nature Reserve) or early in the hiking season on the Laugavegur trail (June-mid July). We also recommend a personal location beacon when travelling in remote areas for many days or in remote areas during the winter. You can rent a personal location beacon from Safetravel here for 1200isk per day. You will want to pack your bag strategically to ensure that it sits comfortably and well balanced on your back. Pack the heaviest items at the bottom, close to your back and the lighter items towards the top. Consider weight and how often you will use items when packing. For instance keep your sleeping bag at the bottom of your bag but snacks at the top. Practice balancing your bag for more a more comfortable hiking experience. We recommend packing things that need to stay dry in separate dry bags (as seen in the above photo on the top row). Use a compression dry bag for your sleeping bag (above photo top row on the right) to pack it down so it fits better in your pack. Keep your clothes, and food in dry bags in case your pack falls in a river or your rain cover fails. After each trip you take, review which gear you used and which you didn’t. You may find you didn’t use some gear and can therefore leave it at home next time. Some gear should not be left at home even though you didn’t use it, such as safety equipment. 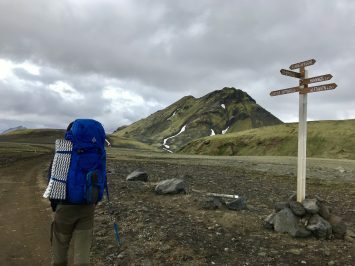 It’s impossible for us to write a perfect guide for every multi-day trek in Iceland. Some gear is mainly based on preference and some depends on travel location. 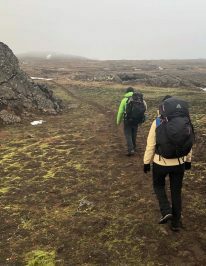 We hope that this answered some of your questions about packing for a multi-day trek in Iceland but feel free to send us any questions you have that weren’t answered in this article.